“It has been a busy year for our development teams as we strive to give UK growers the tools and data they need to improve profitability in a potentially volatile post Brexit era,” said SOYL’s commercial director, Simon Parrington. SOYL was the first company to use satellite imagery on a large scale in UK farming back in 2003. Recently SOYL has connected its archive of satellite data with MySOYL, a cloud-based precision data platform. “Growers can now view five years of imagery which enables them to assess trends and consider the potential impact on final yield when making nitrogen decisions this year,” explained Simon. Imagery can be viewed with a MySOYL silver license which costs just £250 per year. SOYL has recently upgraded weed mapping and feature logging functions within iSOYL so that these can both be managed directly from the tractor cab via the iSOYL app. Growers can be up and running with variable rate applications using just an iPad and SOYL’s iSOYL app. This has significantly reduced the cost of getting started with precision farming. SOYL has made significant improvements to the agronomic models used to calculate variable seed maps. This means SOYL’s variable rate seed maps enable even more precise application giving growers more value from their investment in soil scanning surveys. Variable rate seed is a fast growing area of precision farming and with yield benefits north of 4% it is easy to see why. SOYL’s soil sensing technology is helping to power this growth, “We are now running 11 soil sensing teams every day at the moment to keep up with demand this season,” said Simon. The soil sensor measures topsoil and subsoil variation and when linked with ground classifications can be used as a basis for variable rate seed. A good soil variation map combined with yield and weed pressure data can lead to an optimum seed rate in each part of the field. Many growers are now using SOYL’s scouting app on an iPhone or iPad. 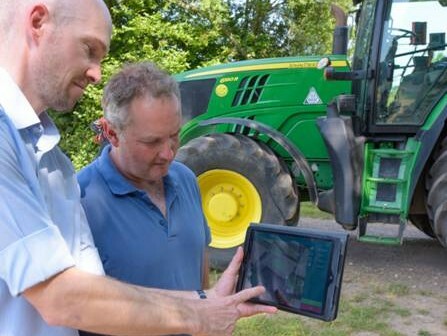 iSOYLscout is a free tool which allows problem areas to be logged, flagged, revisited and shared between growers and advisors all while out and about on the farm. New functionality this year in the MySOYL platform now makes it easier to manage data scouting collected in the field through a new suite of tools. Recognising that information captured ‘on the fly’ often needs tidying up, MySOYL provides a number of tools for this. Growers can now group similar observations into categories, make sure features mapped are accurate and clean and filter data to view what is relevant to the job in hand; be that this season, last season or all time. Growers can also make a plan in the office to scout in the field based on any of the other layers available within MySOYL. This would include yield maps, satellite imagery, soil types, nutrients and plant establishment. The app can then be used to visit and investigate in the field with that other powerful tool – the spade! “Over time a permanent and easily-searched archive builds up on iSOYLscout. End of year weed maps and problems are properly logged ready for future seasons rather than being scraps of paper that inevitably get lost in the farm office,” said Simon.